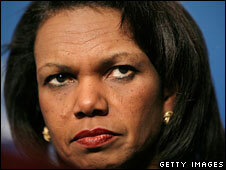 US Secretary of State Condoleezza Rice has implied Arab states could do more to help the Palestinians. Without singling out specific Arab states for criticism, Ms Rice said they should focus on how much they can do - not how little - for the Palestinians. She was speaking on her arrival in London for a series of meetings on the stalled Middle East peace process. Ms Rice will also hold talks on Iran with foreign ministers from the UK, France, Germany, Russia and China. "It's extremely important that people pay their pledges," she said. "States that have resources ought to be looking not for how little they can do, but how much they can do," she added. US officials travelling with Ms Rice said only three Arab League members had made major donations this year - Saudi Arabia, the United Arab Emirates (UAE) and Algeria. US figures show that foreign donors have pledged $1.55bn - including $717m from Arab League members - in financial support to the Palestinian Authority this year. But only $153m of Arab pledges have been delivered, all from three countries: Saudi Arabia, the UAE and Algeria. Speaking before a weekend of shuttle talks with negotiators in Jerusalem and the West Bank, Ms Rice warned that the expansion of Israeli settlements in the occupied West Bank did not mean the houses would remain under Israeli control in a final-settlement deal. "I do not, and the US government does not, accept that anything done prior to agreement can ... present a fait accompli or determine the final outcome of this," she said. Ms Rice added that determining final-status borders was "the best thing we can possibly do". Before she left Washington, the most senior US diplomat said young Palestinians were losing hope of an agreement with Israel. She told an American Jewish audience Israel needed to make "difficult decisions" to provide the Palestinians with the dignity of statehood.